The Eighth Gate: Another Hot Summer? Rumors of a war in the Levant this summer have been in the air since Hezbollah and Israel stopped shooting at each other last August. Most dismissed such talk as Israeli sour grapes after its mediocre performance in Lebanon last summer. Lack of developments in the long stalled Israeli-Syrian peace negotiations, plus a reading the Levantine press over the last week, indicate there just might be something to such talk. And this time around, many say it could involve Syria. On July 3, an article by the well-connected Syrian journalist Ibrahim Hamidi reported a “political escalation” between Damascus and Washington had dashed hopes of a US-Syrian reconciliation following the Rice-Mouallem meeting in early May. The war drums had already started in the Levantine media, however. An aggregation of such reports from the Lebanese, Iranian and Syrian press was released by MEMRI on July 6 (pasted below). In the last 24 hours, these have been followed by reports from Israel of movements on the Syrian side of the demilitarized zone. 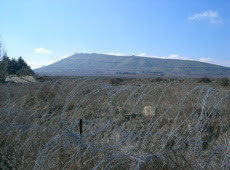 This follows months of small and scattered reports that Syria was preparing for a "Hezbollah-style" guerrilla war along the DMZ in Golan. (see photo above). Pundit and former peace negotiator Dennis Ross chimed in today as well. Is another proxy war between the US and Iran, this time involving Syria, looming on the horizon? In the past few days, Arab and Iranian media reports have pointed to the possibility that Lebanon's current political crisis may become a violent conflict after July 15, 2007. 2. Between July 15 and 17, 2007, the submission of another report to the U.N. Security Council, by the head of the International Investigation Commission into the murder of former Lebanese prime minister Rafiq Al-Hariri, Serge Brammertz. These sources offered a number of explanations for Syria's calls for its citizens to leave Lebanon. IRNA tied these calls to Lebanese President Emil Lahoud's ultimatum to the Lebanese opposition to decide on how to deal with the crisis in Lebanon, and also claimed that the calls were connected to Syria's intention to mobilize reserve units in expectation of an attack on it by Israel. On the other hand, the Lebanese daily Al-Liwa tied Syria's calls to the upcoming additional report by the International Investigation Commission into the Al-Hariri assassination, which is expected next week. For the past month, senior officials in the Hizbullah-led Lebanese government, as well as Lebanese President Emil Lahoud, have been threatening to establish a second government in Lebanon, or to take "historical" and "strategic" steps that will be announced in due course. The crisis between the March 14 Forces and the Lebanese opposition has deepened with the approach of the legal date set for the presidential elections, which the opposition is threatening to prevent, and in light of harsh criticism by the Lebanese government and the March 14 Forces accusing Syria of being behind all the recent attempts to destabilize Lebanon. On June 25, 2007, Al-Akhbar reported that the opposition had already discussed plans to form a second government and to take over the government ministries, in the event that the Al-Siniora government continued to adhere to its current positions. The paper added that the opposition had even begun to name the individuals who will form the second government. A series of op-eds in the Lebanese daily Al-Mustabal, by Nusair Al-As'ad, warned of a planned Syrian-Iranian coup in Lebanon. (9) According to these articles, Hizbullah was planning to launch, in the near future, a new stage in the coup being led by Syria and Iran in Lebanon, during which it would use its weapons on the domestic Lebanese front. The threats by the Lebanese opposition to establish a second government in Lebanon were part of this planned coup, and the coup was to be carried out under the banner of establishing a second government. The articles stated that the threat voiced by Syrian President Bashar Assad during his April 2007 meeting with U.N. Secretary General Ban Ki-Moon, namely, that the situation in Lebanon would "reach the point of civil war," was actually "an official declaration of the coup he is now staging in Lebanon." According to the series of articles in Al-Mustaqbal, Hizbullah was continuing military preparations in a number of locations in Lebanon, as part of preparation for the next stage in the Lebanon coup. Hizbullah's weapons were for two main purposes: a) to be used in a conflict with Israel, to assist the Syrian regime in a war with Israel, or to assist Iran in a confrontation with the U.S.; and b) to be used for fighting in Beirut. c) Hizbullah's training of activists from other organizations loyal to the Syrian regime. One of the articles in Al-Mustaqbal asked whether Iran's involvement in the Lebanon coup was evidence of a change in Iranian policy, which had previously been that everything possible must be done to prevent Sunni-Shi'ite civil war in Lebanon. It read: "The dossier of Iranian-Syrian relations, and Iran's relations with influential Arab countries, has passed entirely into the hands of Iranian Foreign Minister Manuchehr Mottaki, and Iranian National Security Council Secretary Ali Larijani no longer has anything to do with this issue..."
According to the articles, the positions of Larijani – who had previously been in charge of this dossier as the personal envoy of Iran's Supreme Leader Ali Khamenei – had been more flexible, and he had represented the position that Iran's relations with Lebanon should not depend entirely on Syria. Further, Larijani had even expressed dissatisfaction with the actions of the Syrian regime, and at the fact that "Syrian President Bashar Al-Assad had closed off all horizons for a solution in Lebanon..."
The articles stated that "during his last visit to the Syrian capital, Mottaki heard from the leadership of the Syrian regime some sort of protest over the 'red line,' to which Iran had agreed in its negotiations with Saudi Arabia with respect to Lebanon [and] which was aimed at preventing civil war between Sunnis and Shi'ites in Lebanon... The fact that Mottaki has [now] been given the entire dossier begs the question: Does this development [mean] a return to the previous stage in the relations between Iran and Syria, that is, the stage at which Iran had to go through Damascus and back it [on the Lebanese issue]?" The articles also stated: "A review of recent Iranian activities reveals that lately Iran has not refused any Syrian request... Does Iran's current backing of a coup in Lebanon [mean] that it has reneged on the January 2007 agreement with Saudi Arabia on the 'red line'... of [preventing] civil war in Lebanon?..." (1) Al-Hayat (London) June 27, 2007. It should be noted that on July 2, 2007, Lebanon deployed about 300 soldiers from the internal security forces along the Syria-Lebanon border to assist the Lebanese army in supervising the border. Al-Mustaqbal (Lebanon) July 3, 2007. (2) IRNA (Iran), July 5, 2007. (3) Al-Sinara (Nazareth), July 6, 2007. (4) Al-Liwa (Lebanon), July 5, 2007. (5) Al-Thawra (Syria), July 5, 2007. (6) Al-Akhbar (Lebanon), June 18, 2007, June 19, 2007. (7) Al-Akhbar (Lebanon) June 25, 2007. (8) Al-Mustaqbal (Lebanon), July 2, 2007. (9) Al-Mustaqbal (Lebanon), June 30, 2007; July 2, 2007; July 3, 2007.